I think she's intelligent enough to be fully aware of what she's doing, but going along with it because of what it is - television, sensationalism, drama, and mirch masala. The way of the entertainment world. E...I remember a line from Devdas....that went something like this k" bhagwan barish tawaifon k kothey per bhe barsata hey"... I dont know if it makes some sense here or not but as I observed life is never like black and white, it exists in greys...I also hate hypocrisy but if someone chooses to celebrate Ramzan kareem in their own way there is no harm in it. I saw prostitutes fasting in Ramzan and muharram with due respect for holy months. Veena Malik doesn't stand for anything except money. All of her actions up till now have just been very well planned solutions to get more media attention and thus lucrative deals. I actually admire her disregard for culture in her work. A lot of people put principles before their actions, unlike having their actions be their principles. Having said that, one shouldn't expect anything from her, except staying in the news and working for it. LeWhore Heeramandi is closed for 10 days in Muharram every year. :) it is very true about ! or at least thats what they told me when I visited that place. Strange.... remember drunk whore during play sessions everytime there was sound of Azan she grab her dupatta or any nearby cloth to cover her head. So it clearly shows they also follow religion. Religion is not for the pious and nobles only! As far as Veena is concerned she is having time of her life and experiencing everything in the spectrum. lol yeah i saw that on fb last week and thought it was incredibly accurate! 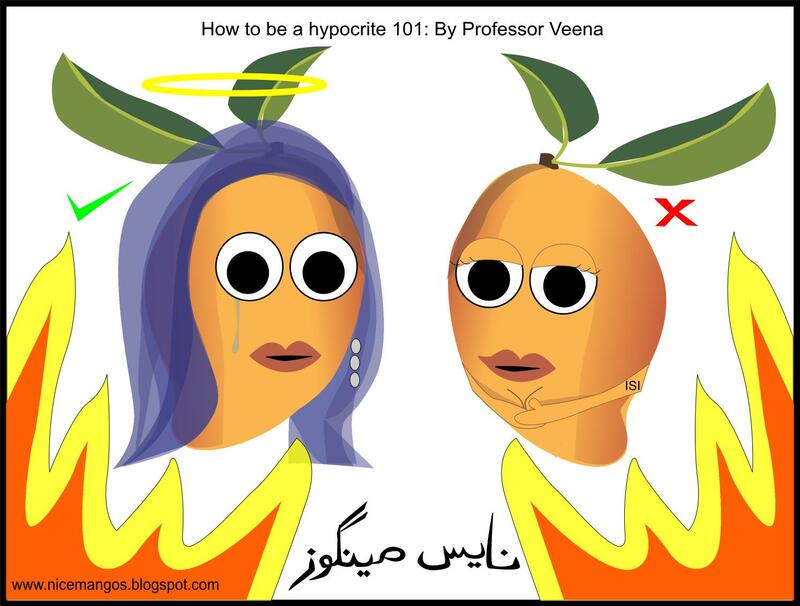 Hypocrisy, as a pejorative, is often unfairly imputed. One (and this is my opinion) has all the right to be as two-faced, hypocritical as possible when it so to protect oneself from the prejudice of others. I am all for exploiting inherently exploitive beliefs; It’s people that deserve respect, not beliefs, and, then, only if they are themselves decent human beings. More power to Veena. Your problem lies in thinking Veena is in it for principles :P She's only in it for the money. She wasn't fooling me before and she isn't fooling me now. All her talk about principles and hypocrisy was a complete farce. I loved this, i truly did... I applaud her for garnering so much attention.. Same with Ramzan.. You cant pick and choose what you want to adhere to with religion - i thought it was supposed to be all or nothing!